After the Canberra Raiders slapped a six-week suspension on fullback Jack Wighton for an unprovoked attack on five men in Civic following a big night on the town, NRL CEO Todd Greenberg was quick to reject the ban on the grounds it was not ‘high enough’, upping the punishment to 10 weeks and a $30,000 fine. This is a typical case of grandstanding by Greenberg and the NRL and hypocrisy of the highest order. Before State of Origin Game 2, damning research was revealed that showed a massive spike in domestic violence in NSW on Origin game days. The research caused a public stir, circulating across major newspapers, radio and featured on the national television show The Project. This was a perfect opportunity for the NRL to step up and take the lead on the issue by condemning the violence and rethinking the ways they promote the game – with booze and ‘the biff’ at the forefront of their marketing strategies. Instead, the NRL battened down the hatches praying for the storm to blow over. The silence from NRL headquarters was deafening. It was a move which showed no regard for the victims of domestic violence – namely women and children – and those tasked with dealing with the aftermath – family members, women’s shelters and emergency services. Unfortunately for the NRL, the storm came back again before Game 3, when a new campaign with disturbing and powerful imagery highlighted how domestic violence surges in the UK when England plays in the World Cup – and rises, even more, when they lose. The statistics from the UK mirror those of the NRL, and the obvious link was made, with Australian news outlets bringing the research back into the news cycle before State of Origin Game 3. Here then was another opportunity for the NRL to take a stance against domestic violence – and again silence. What followed the final Origin game on Wednesday night game was a complete affront to all domestic violence victims. In a completely tone-deaf moment, the NRL chose to showcase an image of victorious NSW players drinking beer from the State of Origin shield on the NRL’s official account. The image was met with outrage by many NRL fans who had the links between State of Origin, alcohol and domestic violence fresh in their minds. Thankfully the photo has since been removed, but the damage had already been done. During his sanctimonious press conference on the Wighton suspension, Greenberg stated “We have always maintained that players at clubs are their employees and they set culture within their clubs”. 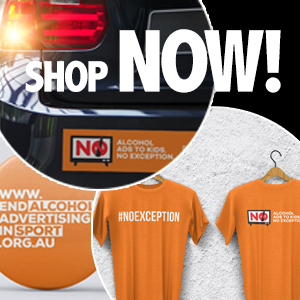 Isn’t it about time that the NRL recognises that through sponsorship, promotions and their own actions (or lack thereof) – it is itself fostering a culture of binge drinking and violence? Wighton has become the NRL’s latest sacrificial lamb. But a sacrificial lamb fixes nothing if the code itself remains weak on violence. Should Wighton be held responsible for his behaviour? Absolutely. But the NRL must do more than admonish its own players. Greenberg and the NRL need make sure the culture bar they set for themselves and the code they represent is ‘high enough’ to impact the violence happening on its watch. As Greenberg himself admitted, when addressing Wighton’s brutal act – “ultimately the power rests with us”.